This topic contains 24 replies, has 3 voices, and was last updated by Bob Swika 1 year, 8 months ago. 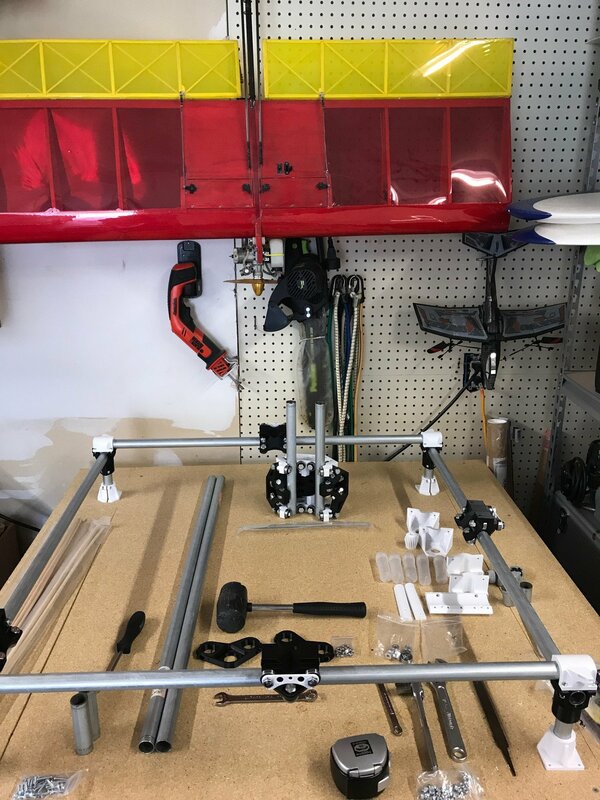 Got my MPCNC kit last week. 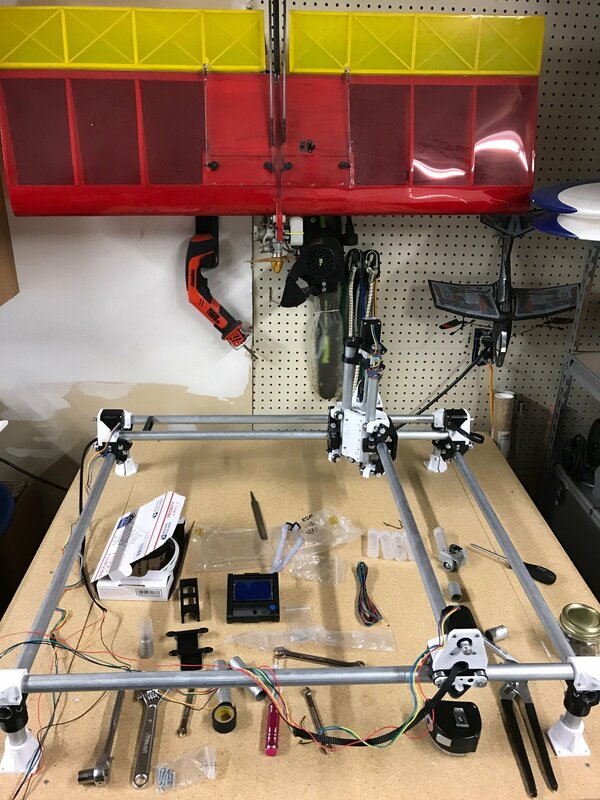 I’m about 3/4 way through printing the parts. Went to Home Depot today and pick up some conduit and wood to make a table. Table built so now when I’m done printing and cutting conduit I have a home for the machine. Size will be “24 x 24″ x 4”. It will be used for milling and possibly a laser down the road. My suggestion at this point is cut all the tubes and belts and things for the size you want but shrink the near and far axis (whatever you choose to label it) and get some cam experience on a very rigid machine and when you get some time under your belt then expand it if you need to. A small rigid machine is extremely forgiving to learn on. Expanding it later on should only take 30-60 minutes later on. Just trying to make it fun to learn on, there have been a few larger builds in here that seem to cause a lot of frustrations. Making progress, slowly but surely. 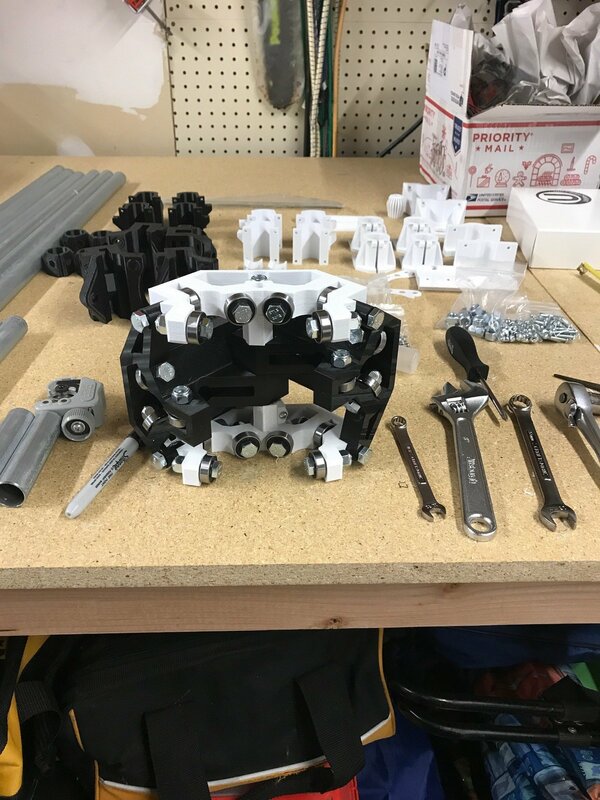 Whoa, whoa whoa…you are building this to dirty up that shop space a little bit right? Looks like a doctor’s office in there it’s so clean. 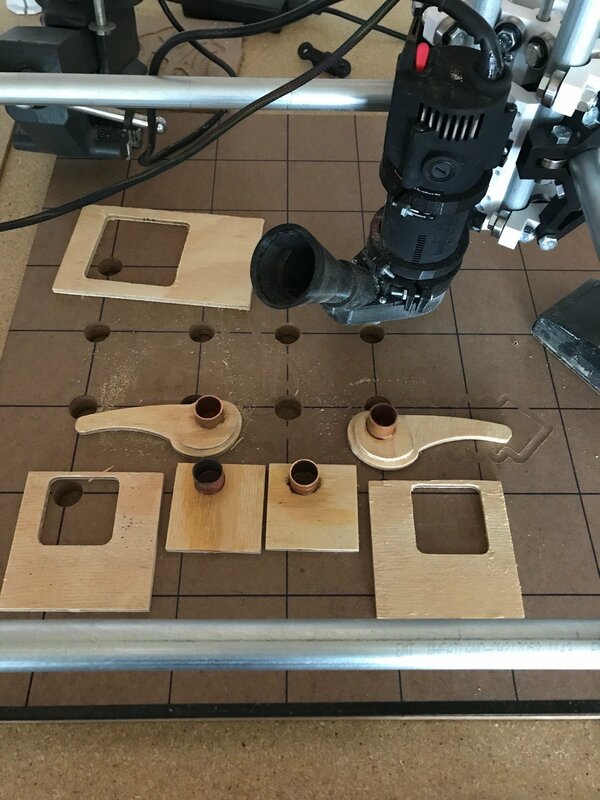 Don’t worry the MPCNC will help make a mess of that place real quick! It only looks clean since the table is new. 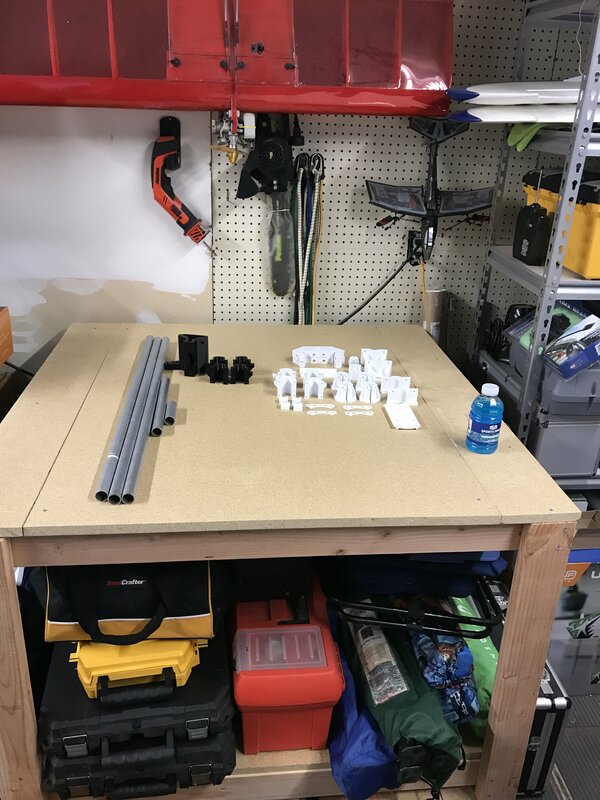 I had to make a shelf for the table to put all the stuff that was on the floor where the table went. I am really looking forward to getting it dirty. I must say that the MPCNC is going together much faster than I though it would. I have one of the mini rambo boards from your site that I’ll be using. Hopefully I’ll get to work on it some more this weekend. So it’s coming together, all the steppers are mounted. Just waiting for more cable covering to finish running the wires. The machine is not screwed to the table or squared yet, I need to pick up some more screws. Hopefully I can make some more progress this weekend. I cheat with the cable covering. On the far side steppers I only have 4 or 5 inches of covering and then a few more at the other end usually. Seems like a waste for it to just be sitting in the tubes and sometimes I need to unplug the steppers. You know, you are right. No need to have the covering sitting in the tubes where it has nothing to run on. Didn’t even think about that. Thanks. Up and running. I have a lot of learning to do. Got the router attached and got the garage a little dirty. Still learning ESTLCAM. 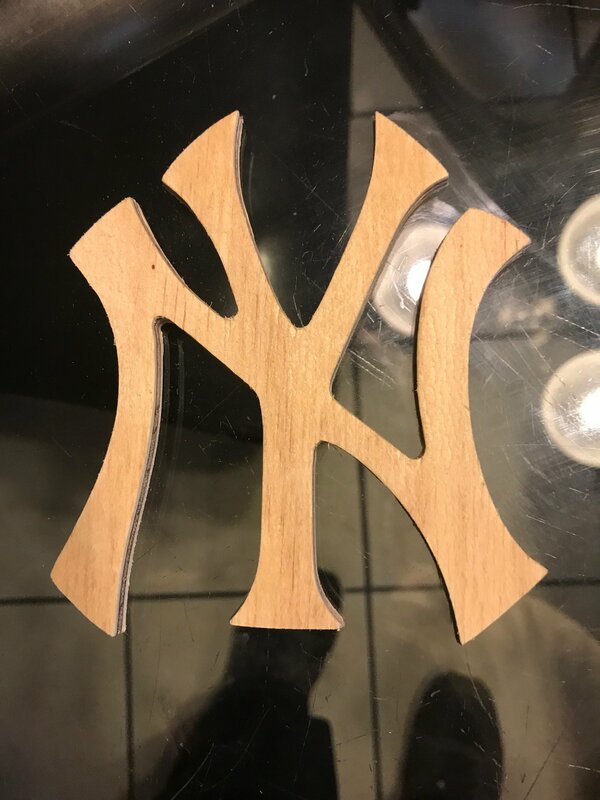 I initially tried using a Dremel and the results were pretty bad. The router made a huge difference in quality. Not sure why the video looks like it’s sideways, it doesn’t play that way on my phone?? Those cuts look great so far. The machine is cutting what I would consider fairly well. I made the claps that I saw in another thread. Initailly I made them by hand and they would eventually vibrate loose. I figured that my cuts were not accurate enough so I made a set using the MPCNC. I’m not sure what I’m doing wrong but after a while cutting they still loosen up sometimes. Wonder if this is common with these clamps or if it’s just mine. 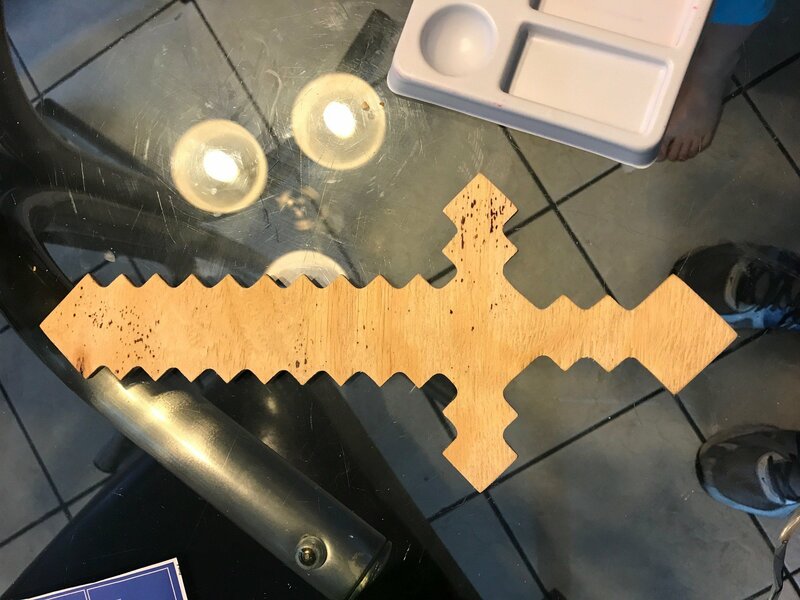 Also by request of my kids I made a Minecraft Sword. Thanks for a great project. Oh bummer, I want to make a set of these. Maybe it is just a thickness thing? A little thicker and you get more contact area? Or if you can adjust the speed of that “spindle” you can get a smoother cut with less vibration. I have been messing with a ton of variables and yesterday I was kind of surprised at the results and put a vid on youtube. if you get the right bit and RPM, and the help of a good cut path it can cut really smoothly. 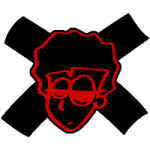 I was thinking of making a set a little thicker, I made them the recommended thickness. My other idea is to have a little wedge that goes under the handle to stop it from loosening. What a difference a good bit makes. Up until now I was using the 1/4 bit that came with my cheap router. I got my bits today from v1engineering.com and my cuts are so much better. I used to have to do a lot of sanding to get them to look as good as this one does right off the router. Yeah buddy! I learn something new everytime I run a cut. So now that you have decent sharp stuff your jobs will get a bit faster and less post processing by hand. Another for the gallery, thanks! Thanks for a great design. I’m really enjoying this machine. Your welcome. Is it bad to say I enjoy the heck out of mine as well. Still hasn’t gotten old to me. Can’t wait to see what is next for you! It’s not bad at all, I’ve been 3D printing for quite a few years and it still hasn’t gotten old. I can see myself using this for a long time. My goal is to be able to eventually cut out RC planes. That’s the hobby that never got old for me. Doing it 20+ years. I bought the kit and I am having fun. Enjoy. By the way I noticed it said inPA. I am in Pittston, PA. Between Scranton and Wilkes Barre. I’m in Eynon, about 10 minutes outside of Scranton. Sorry, I did not get email update from this post. Maybe we could get together and help each other. Probably you more then me helping you. I get a nice one and then all goes haywire. I need to spend more time on machine, but work is crazy, and I only have a few hours a week. Working 6 days. I know the feeling. Working a lot of hours myself. Between work and kids I don’t get much time to play with it, I’m still very much a beginner. It’s been a few weeks since I tried to cut anything but hope to get back into more soon.